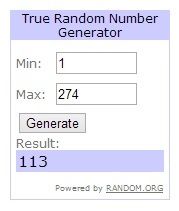 So , Without further ado, The winner of the $30.00 Gift Certificate to Rustic Rooster Quilt Shop is . . .
#113 who happens to be Diane . . . who can now buy some Indigo Crossing :) Congrats to Diane!!! And just as an update . . . David is doing so well on his recovery!!! His surgeon says he is the overachiever of the entire floor :) Here he is, finally getting to be held by his mommy. It's a good day!!! Thank you again for all of your kind words, thoughts, and prayers for David, you all are the best!!! Congratulations to Diane, that is a nice line, I do have some of the mini cuts. I am glad to hear that David is doing well and that is a sweet photo of him. Thank you for sharing the great news about David! Congrats to the winner....and to baby David! Congratulaions to the winner and thank you for hosting. So lovely to hear things are going so wonderfully. Beautiful baby and mother. Prayers are continuing for all of your family. Thank you for the update. Blessings. I'm so glad that David is doing well. Hopefully he will get to go home soon. Lovely to see David doing so well. Hope he's home really soon. "Overachiever".... love it! So glad he's such a trooper! So, glad to hear that he is doing much better. Congrats to the winner! Cutest little over achiever I have ever seen! So glad to hear he is doing so well. Mommy looks so happy too. whoohoo for David! We so hate to see little ones struggle~ it is good to hear he is doing so well! T&P's will continue. congrat's to Diane too! I'm so glad to hear that your sweet new nephew is doing well. He is such a cutie. And of course I thought it was you in the picture. So happy to hear the good news. I love how prayer works. Thank you for the update on David. So pleased to hear of his good progress. It's marvelous news for everyone. Awesome. Little man. And mama. Really happy you posted the picture of your sis and little David! He is pink, pink, pink! What a wonderful color! Hurray for David! That is such great news! And what a happy momma smile that is! Congratulations to the winner! Sigh...so very glad to see that little David came through the surgery with flying colors! That is the best medicine, being held by mom, so glad David is doing better.